...North American three rail 'O' gauge electric trains, run on approximately 20 volts A.C. They are coarse scale 'O' gauge and differ from modern British 'O' gauge in their use of the third rail, and of A.C., rather than D.C. However some early Hornby electric trains used this system. The manufacture of these American trains started just after the turn of the century, about 1906. Up to World War II, most of them were in tin-plate and die-cast metal. After World War II plastics replaced the tin-plate, while use of die-cast continues. Less well known is the slightly smaller 2 rail ‘S’ gauge. The following is a brief precis of their manufacturers history, with apologies for any omissions:. 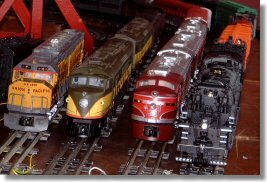 Lionel Trains Inc. is the sole survivor of the major North American Pre- World War II 'O' gauge manufacturers. Ives, A.C. Gilbert's American Flyer and K-Line were acquired by Lionel, when they hit difficulties in 1930, 1966 and 2006 respectively. Today the main competition to Lionel comes from newer manufacturers Atlas O, MTH (Mikes Train House), Weaver, and Williams by Bachmann, who have entered the field in the last 20-30 years..
Those who went to London just before Christmas in the 1950s and early 1960s will possibly have seen the 'Gamages' Christmas display, which included an extensive selection of Lionel's products. .
Interest in the North American trains has revived with the formation of the 'Lionel Collectors Club UK ' in 1980. The club currently has over 70 members and publishes "Shortline" quarterly. The magazine includes articles of interest relating to all aspects of American three rail ‘O’ guage, the North American Railroads on which they are modelled, repair and service tips and items "For Sale" and "Wanted". The club has an annual show in the Winter Gardens Hall, Ilkley, late May / early June, and also runs a layout at various local shows.